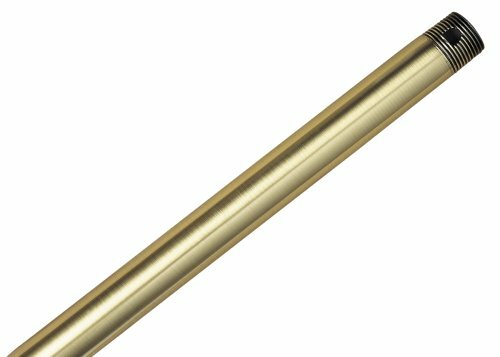 As more homes are constructed with higher ceilings, the Antique Brass Hunter 3/4" Downrod Extension fills the need for mounting fans at the right height for optimum performance. The extension sets the fan at a perfect height for evenly cooling a room. Constructed to fit only Hunter fans, this extension is also finished in Antique Brass to match the fan mounted to it. The tapered threads at the ends allow for better hold once the fan is mounted. The rod is 36" long and is best used for ceilings of 12 ft. Hunter fan extensions should only be used indoors. Available in Antique Brass, Antique Pewter, Black, Brittany Bronze, Bronze Patina, Brushed Nickel, Burled Brown, Chestnut Brown, Hunter Bright Brass Finish, New Bronze, Sand, White, or Weathered Brick.